Gluten-Free Living > Tips > What vegetarian dish can I throw on the grill for non-meat eaters? What vegetarian dish can I throw on the grill for non-meat eaters? Try this In-Side Out Burger! With a few extra steps it’s easy to give a basic burger a little bit of flare. This recipe uses nuts as a binder instead of breadcrumbs. It also has cheese inside the burger instead of on top to give everyone a bit of a surprise when they dig in. Another plus is the cheese stays melted longer. 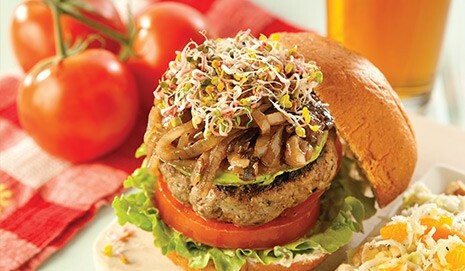 The burger is topped with sweet and savory balsamic onions. These burgers are so good you can enjoy with or without a gluten-free bun.